As life gets seemingly busier, finding time for golf is a challenge for us all. 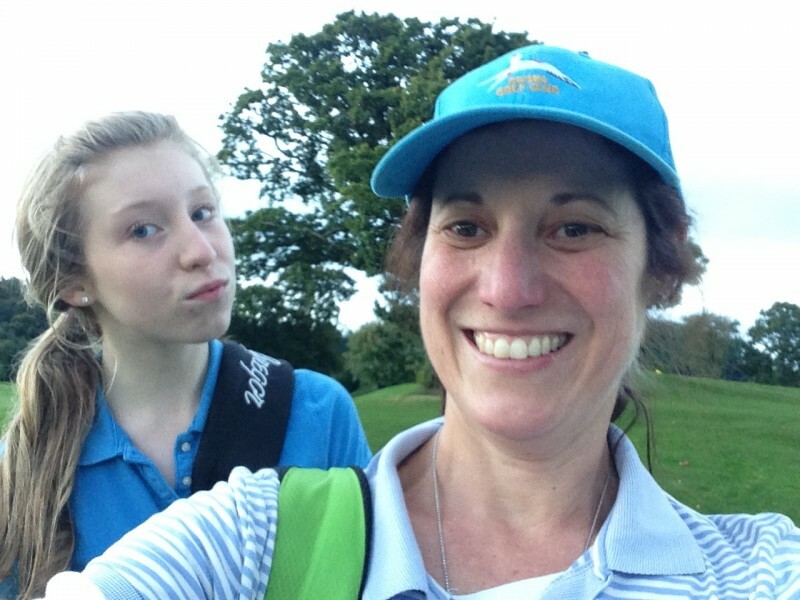 But when your daughter asks, “When are you going to play golf with me, Mum? !” It was sweet music to my ears and the question I have been waiting all year to answer! Moreover, that is why this ‘gift of golf’ is so brilliant: it keeps giving me unexpected joys. 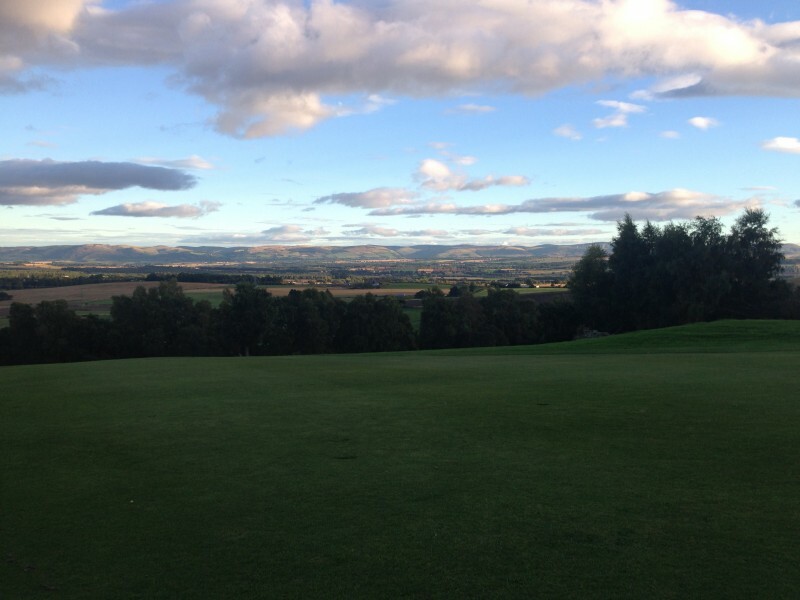 We decided that Tuesday evening after school we would go up and have a round on the second course at Crieff, The Dornock Course. It was a lovely evening as you can see. There were several groups in front of us, so we warmed up with a hotly contested ‘wee match’ on the practise putting green. Here is Siobhan winning the first hole! But I am relieved to report that her dominance did not last long. The intense match went back and forth. I was 2 up after 5, only to be all square by the 8th. Going down the last tensions were raised, but the ‘golfing gods’ were on my side and I took the hole with a ‘tap in’ two. The match, however, was NOT conceded, as I am informed by the Match Referee (aka Ms. Siobhan Bell). So it will continue, but at least it does with me 1 up!!! It was time to get out to the course, and as a course I have played before, sometimes I forget its finer details. So when Siobhan pointed out to me this sign, I had to smile. As you can see there are several to choose from, so we had another good laugh!! Here she goes and she hit a great shot off the first. Siobhan is only using a seven wood, but she can hit it almost as far as I hit my driver! I am going to have to get to the gym or I am sure to be out played sooner rather than later. It was great fun playing with my ‘teenager’ and it reminded me what I love most about golf: it gives you time to connect to yourself, your playing partners and the beauty of the world. It was outstanding to talk golf and life on such a beautiful evening in the ‘heart of Scotland’ with our beautiful girl. So she went to sit down on one to rest, and Little Miss ended up with a wet bum! She had to play the rest of the round with a wet backside. But she played really well, so maybe she might have to do it every time!!!! It certainly kept us laughing for the next several holes: that is one way to play 'happy golf'! The Dornock Course at Crieff is the original nine holes before the Club expanded to add a further 9 holes, giving it its current format and layout. There is something of Old Tom Morris still out on the Dornock Course, and I was telling her how her Dad remembers the ‘lemonade stand’ at the back of the 5th hole when he was a boy. (To which she naturally responded, ‘Boy you guys are old!’ Thanks.) But its a lovely course with plenty of challenge. We finished the hole with a par and a bogey, so we happily went to the 7th tee. There is a deceptive amount of trouble behind the 7th green. Siobhan was long at her peril. But we navigated the tough par 3 8th and moved happily to the 9th with the sun setting. I had to laugh and tell her the story of when she was just a few days old Nana said to me, ‘What ARE you going to do if she doesn’t like golf Beth? !” I just shook my head and looked at the baby in my arms, before replying, ‘Well, she will have to or she will be spending a lot of time with a child minder!! !’ Fortunately, my daughter seems to take to golf just like her mother: we have another ‘lady of the links’ in the making! And once home, I was informed that my 'selfies' are a disgrace. So I was duly put through a hilarious hour of ‘selfie instruction.’ I had no idea it was such a complicated procedure! I seem destined to fail miserably. Oh well, I am more concerned with my putting stroke, but that's just me.